The year 1972 was a pivotal time for Southwest Airlines. It was the year that its vice president of ground operations, Bill Franklin, came up with an idea that would help save the little airline from being stomped out by the competition. Southwest had posted a loss of more than one-and-a-half million, and had to sell one of its planes in its small fleet of four. The airline needed something to keep it afloat and Franklin was responsible with coming up with a solution. That’s when the 10-minute turnaround was born: Get flights in the air faster so more flights can be made. It seemed impossible – get people off and onboard and ready to take off in 10 minutes? But everyone on the team from the in-flight crew to the ground crew came together to implement little efficiencies that added up to big time savings. That next year, the airline showed its first profit. The quick turnover saved Southwest. Today, the airline is still known as having one of the most efficient turnarounds of any airline. The Southwest story is one of better turnover leading to more flights and more profit. In the operating room, faster turnover can also show big benefits – but not with the goal of cramming in more surgeries. 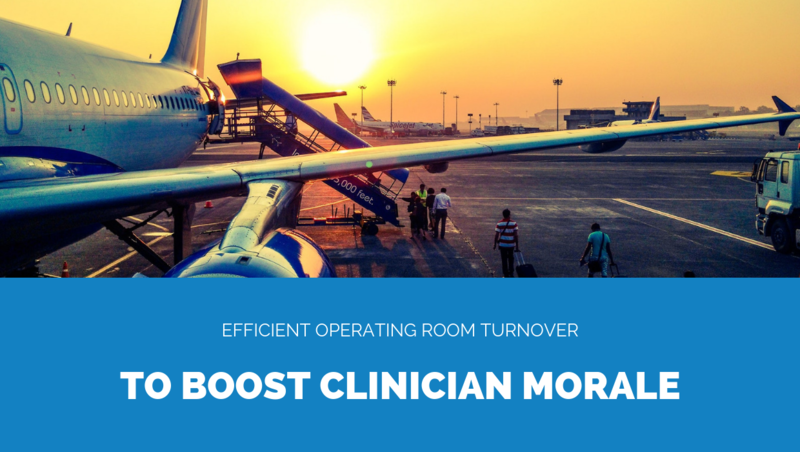 Instead, faster turnover can lead to financial gains and better morale for clinicians. Physician burnout is a real thing. Today, clinicians are more overworked than ever. In a 2016 study by the Mayo Clinic, more than half of the physicians studied reported at least one symptom of burnout –about a 17 percent increase from 2011 results. Satisfaction with work-life balance also decreased from about 49 percent to about 40 percent since 2011. In the operating room, many are wired for the intense career of being a surgeon, but many more would probably like a few extra minutes at home with family or those who are important to them. That’s what a more efficient OR turnover can do. And this is a point of collaboration for hospital administrators and surgeons when it comes to increasing the efficiency in operating room turnover and boosting work-life balance. For the clinicians who may be wary of adding more efficiencies in OR turnover because they think it would mean more cases, let’s clear up the air with some simple math. To add just one more case to a standard OR workday, you would have to reduce OR turnover by such a significant rate, that it would almost be impossible. Doing the math, let’s assume you have an eight-hour shift, and each case is 60 minutes with an average 30-minute turnover time. This would allow for five cases in a standard day. To squeeze in another case, turnover time would need to be reduced by 50 percent to just 15 minutes. This is not a likely scenario. The opportunity to end the workday earlier. A reduced likelihood of overtime costs for support staff. As illustrated above, there is still a financial benefit to more efficient OR turnovers without having to add another case. For more on the economics of turnover time, see this presentation by Franklin Dexter, MD, PhD, a professor in the department of anesthesia at the University of Iowa. Aside from the financial gains, there is another benefit: Repurposing saved time. The way you streamline OR turnover is by effectively eliminating non-value add work – looking at what can be done the same or better in less time. Building on the example from the previous section, if you were able to improve OR turnover by five minutes for each of the five cases per day, you’d be left with 25 extra minutes – and remember, that’s 25 extra minutes for each member of the team. So what do you do with that time? One might jump to the conclusion that you could eliminate some staff and reduce costs. We don’t want to do that because eliminating OR support staff would do the exact opposite of boosting clinician morale. Instead, OR staff could provide additional support to clinicians by diverting that 25 extra minutes per person to high value-add work. This is a great opportunity to take work off the clinician’s plate. Take something off their “to-do” list that’s been on there for a while. Ask the clinician directly how he/she could be better supported. With the added support, clinicians themselves would have the freedom to work on more value-add tasks sooner, and can even leave earlier in the day to go home. This would improve work-life balance, and in turn, help boost clinician morale while reducing physician burnout. Administrators will also see the benefits of more efficient OR turnover because more work can be done with fewer resources. "In our department, it's less likely that we would schedule additional procedures with found time, but there is huge value in getting me through my cases faster so I can get the rest of my admin work done to get home to my wife and kids earlier." That’s a quote from Jon C. Gould, MD, a professor and chief of general surgery at the Medical College of Wisconsin and Froedtert Hospital in Milwaukee who recently assessed the application my company (ReadyList Surgical) offers to improve OR turnover. It’s all-too-common for a surgeon’s work schedule to overtake their personal schedule. I’m reminded of a story about Nancy Asher, MD, PhD, who was UCSF Health’s first female chair of the department of surgery. Both she and her husband are brilliant top surgeons. At the end of the day, many surgeons often face the conundrum of being both successful clinicians and hands-on parents. A more efficient OR turnover can potentially help them attain both. If you are interested is increasing efficiency in OR turnover so that you can help clinicians get back some of their time and boost morale, use the points outlined in this article to help you build support for your efforts. Fortunately, with efficient OR turnover, everybody wins. This make building support among all impacted parties much easier. OR support teams win by taking on more meaningful work. They’ll spend less time on non-value add OR turnover activities and can spend more time doing work that directly benefits clinicians. Administrators win because OR support teams are getting more work done with existing resources. Also, improved turnover efficiency brings an opportunity to reduce overtime costs. Clinicians win because they gain additional support in the OR. Surgeons and anesthesiologists also have an opportunity to wrap up cases early, all of which leads to improved morale. Southwest Airlines became a role model for how efficient turnaround can impact the bottom line in the airline industry. Now, many hospitals are looking at how to improve their OR turnover, and becoming role models when it comes to efficient processes that lead to improved work-life balance for clinicians. Have questions or want more information? Please leave me a comment below or connect with me on LinkedIn. Brian Herriot is a hospital operations leader and CEO of ReadyList, Inc. ReadyList software ensures fully operational surgical environments to help clinicians focus their time on patients. Do you agree? Leave us a comment.